Moon speaks during a meeting with 2,500 clergy in Washington on April 16, 2001. He was on a national unity tour. (CNN) - The Rev. Sun Myung Moon - founder of the Unification Church, which gained fame worldwide decades ago for its mass weddings, as well as the Washington Times - died early Monday in South Korea, the church said. The Universal Peace Federation said on its website that Moon died early Monday morning of complications related to pneumonia. He was 92. "Our True Father passed into the spiritual world at 1:54 AM Monday, September 3rd, Korea time," a message on a Unification Church English-language website said. "Words cannot convey my heart at this time," Thomas P. McDevitt, the Times' president, said in a story on the newspaper's website. "Rev. Sun Myung Moon has long loved America, and he believed in the need for a powerful free press to convey accurate information and moral values to people in a free world." Doctors put Moon in intensive care in a Seoul hospital last month after he suddenly fell ill, church spokesman Ahn Ho-yeol said then. At the time, physicians gave him a 50% chance of survival. Days later, one of his sons - the Rev. Hyung Jin Moon - noted in a sermon posted on a church website that his father had multiple health problems in recent years, including heart surgery performed in the United States about 10 years ago. But still, he pushed on with his life's mission. "Father, who is responsible to save the world, pushed himself way beyond his limits," said the son, who himself has a leading role in the church. Moon had been a high-profile international evangelist for decades. He's founded several groups such as the Universal Peace Federation, which advocates for "building a world of peace in which everyone can live in freedom, harmony, cooperation and prosperity." 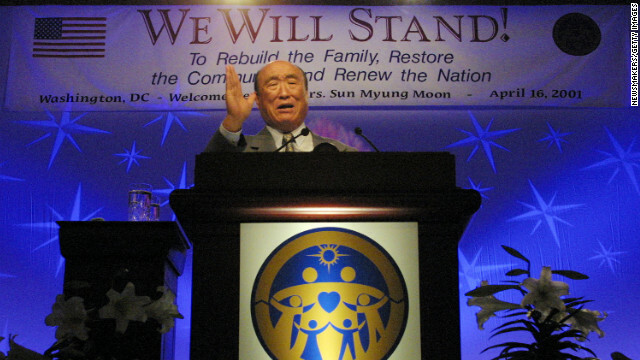 The Unification Church - which has members worldwide, from Brazil to Russia to the United States to South Korea - preaches that message and others. Moon's family members hold leadership positions in the church. In addition to his sermons, the elder Moon is also famous worldwide for conducting mass weddings, including one in 1982 at New York City's Madison Square Garden. Many met their spouses-to-be for the first time during such ceremonies, including one in 1995 in South Korea uniting 360,000 couples. Arranged matches are a common practice for members of the Unification Church. Howard Self, a spokesman for organizers of a 1997 mass ceremony at Washington's Robert F. Kennedy Stadium, said after that event that those blessed by Moon could then be legally married later "in their own countries." "Even before you're matched, you know that you're going to base your relationship on internal aspects because you don't know what the person's going to look like," said a man before his 1997 union to a woman he had met less than a week earlier. The controversial Moon, whose church critics have said leads a cult whose followers were colloquially known as "Moonies," served a federal prison term in the United States for tax evasion. Between 2003 and 2005, the British government prohibited him from traveling to that country, according to a U.S. State Department report. Still, he continued to be regarded highly elsewhere - including in Washington. A video from 2004, posted on the website of what was then known as the Interreligious and International Federation for World Peace, showed a ceremony taking place in a U.S. Senate office building attended by Moon and several members of Congress. Speaking Korean, Moon declares himself the messiah and says he'd spoken to the spirits of Nazi leader Adolf Hitler and Soviet leader Joseph Stalin, both of whom he said found strength in his teachings and mended their ways. Rep. Danny Davis, D-Illinois, is seen reading a poem and, wearing white gloves and carrying a crown on a pillow to Moon and his wife. Davis said later he thought it was all part of an interfaith peace ceremony, adding that Moon didn't ask his "permission to call himself the messiah." Moon was traditionally a strong supporter of Republican politicians including Richard Nixon and Ronald Reagan, said Eileen Barker, a professor at the London School of Economics and Political Science. He was also known for being "virulently anti-Communist," having been imprisoned in North Korea during the Korean War before being freed by the allies, she said. Moon softened his hard line on North Korea, though, over time - even meeting North Korea's founder (and grandfather of its current leader), the late Kim Il Sung, and investing money in the north. His church believes that Jesus was divine but he is not God, a position that puts the Unification Church outside the bounds of traditional Christianity. Followers instead regard Moon as the messiah who is completing the salvation mission that Jesus Christ failed to accomplish. In the sermon from August 19 posted online, the Rev. Hyung Jin Moon praised his father's efforts over the years, as well as stating some of the family's political positions as regards China, Russia and others. He also made a point to thank those who have been praying for his father's health. "We need to remember, father is not just a normal person," said the Rev. Hyung Jin Moon. "Father's body is not just a normal body." –CNN's Richard Greene, K.J. Kwon and Greg Botelho contributed to this report. It's the best time to make a few plans for the future and it's time to be happy. I've learn this publish and if I could I wish to counsel you some attention-grabbing things or suggestions. Perhaps you could write subsequent articles regarding this article. I desire to read more things about it! PLEASE ASK THE CANDIDATE THE FOLLOWING QUESTION. JONATHAN POLLARD HAS SPENT ENOUGH TIME IN PRISON. WORLD VS ISRAEL. HILLARY CLINTON-THIS IS A MESSAGE FOR YOU – LET MY PEOPLE GO. FREE JONATHAN POLLARD NOW. LET MY PEOPLE GO BARRAK HUSSEIN OBAMA – NOW! The Land of Israel is the Promised Land given to our forefathers Abraham Isaac and Jacob and is given to us, their seed, as an everlasting Inheritance. There are a lot of derogatory comments here which are fact-less and unwarranted. If anyone wants to unfairly criticize a man who has invested his life in time to bringing about peace between religions and ideologies, man and God, and eliminating Communism... a man who has been unfairly imprisoned, tortured by Communist, and sent to die in a prison camp because of his conservative beliefs, then go right ahead, but understand that you are on the wrong side of the truth. Before anyone criticizes think twice and actually read what the Rev Moon teaches! What lessons? That we shouldn't evade our taxes? Nothing Rev Moon has done in his 93 yrs of his life has made this world any worse. Only better. Did you know this Moon guy spoke to Jesus Christ three different times? Christ convinced him to start the unification church..... and monkeys fly out of my buttocks. Let me guess. The Rev. Moon ascended to the moon and is there now smiling benevolently down upon us with his pockets stuffed with everyone's cash. SHALOM, THANK YOU FOR EVERYTHING. YOU SHOULD ALL HAVE A GREAT SHABBOS. ASK MR. ROMNEY, AND HIS CONVENTION THE FOLLOWING QUESTION. MR. ROMNEY THE FOLLOWING QUESTION IS DIRECTED TO YOU. IT IS TIME THAT HE IS PARDONED. AND THE AMERICAN PEOPLE AGREE TO THIS. In the name of Me, the most gracious, the most merciful, I resoundly smite the website limitistruth.com, for it is blasphemous. I have declared a fatwa against the creator of the website. Me first. I want to smite it. I am sick of this God guy cutting in on my action. He's dead just like jesus. Is there another kind of prophet? I'm not familiar with this religion. Is this dude supposed to come back with magic points? He had 92 years to deceive, exploit the vulnerable and naive, and to live in luxury and comfort, at the expense of those whom he exploited. Now he must face the Almighty and face the consequences of his heresy and deception. He claimed that he was continueing the work of Jesus Christ, but Moon's life was a far cry from the life of Jesus Christ. Jesus sacrificed everything, including his life, to help others. Moon exploited the very people he claimed to lead. Jesus was and is the son of God. Moon was a false teacher. I wouldn't want to be in Moon's shoes now. He was for unity alright....Just as long as you were unified under the teachings of the Unification Church. Your article on the passing of Rev. Sun Myung Moon was accurate in many regards, but wide of the mark in others. It was not Jesus who failed, but we who were entrusted to receive him. Rev. Moon's view of communism never softened, however he always sought to practice the ideal of loving one's enemies even at the risk of your own life. He went to meet Kim Il Sung of North Korea despite the very real risk of death and boldly proclaimed the fallacy of Kim's juchae philosophy. Kim was impressed by the audacity of Rev. Moon and made special provision to meet and talk with him. Rev. Moon taught that humankind deviated from God's ideal in the garden of Eden and that the purpose of salvation is restoration to the ideal prior to the fall. Every act that Rev. Moon made throughout his life was motivated by the desire to return us to God, our original parent. He brought men and women of every race, religion, and nationality together in blessed marriage in order to bring healing. Grandparents who may have spent a lifetime hating another group found it impossible to hate their own grandchildren. Rev. Moon has planted the seeds for peace and true love. Time will show the merit of his work. we can`t just say anything we want especially when we don`t know exactly what/who the person is...we should respect each others beliefs and practices without being judgemental of others...we should not hurt each other especially when others are mourning!this world would be a better place if we practice what our religion or whatever our belief is teaches us to do...thank you! Another messiah bites the dust. And, like all the others, he isn't coming back. hindu's hind hurts, get some treatment, than to be spewing your hinduism,, absurdities, visit http://www.limitisthetruth.com/ to learn to be human than to be a hindu ignorant like your god monkey. Will Romney have to take time off the campaign trail to attend the funeral? Huh?? What does Romney have to do with this?